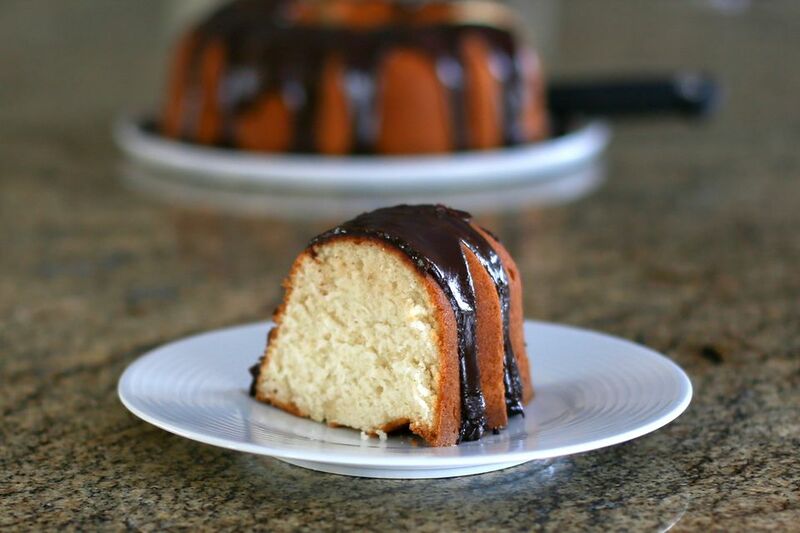 I baked this fabulous classic white cake in a Bundt cake pan and topped it with a chocolate glaze. Cream the shortening and sugar for about 4 minutes for the best results. For lemon flavor, use lemon extract instead of the almond and vanilla extracts. I finished this cake with the included chocolate glaze, but use your favorite glaze or frosting or serve slices with fruit or a dessert sauce. This lemon sauce would be fantastic on the cake, or use a fresh blueberry sauce. Heat the oven to 350° F. Grease and flour a standard Bundt cake pan or spray with a baking spray with flour. Measure or weigh the cake flour and put in a bowl. Add the baking powder and 1/4 teaspoon of salt to the flour and whisk to blend thoroughly. Set aside. Put the shortening in a large mixing bowl. Beat for 2 minutes, until fluffy. Add the sugar and cream the mixture for about 4 minutes longer, until light and fluffy. Add the 1 teaspoon of vanilla and the almond extract and beat until thoroughly blended. In another (metal or glass) bowl, with clean beaters, beat the egg whites until stiff, but not dry. Set aside. Add about half of the flour mixture to the creamed mixture and mix until blended. Add the milk and mix until blended. Add the remaining flour mixture and mix just until well blended. Fold in the egg whites until well incorporated. Spoon into the prepared Bundt cake pan and spread evenly. Bake for 50 to 55 minutes, or until a toothpick inserted into the center comes out clean. Cool in the pan on a rack for 10 minutes. Invert onto the rack to cool completely. Glaze the cooled cake with the chocolate glaze (below) or frost as desired. Melt the butter and chocolate in a double boiler or bowl over simmering water. Remove from the heat and beat in the confectioners' sugar, boiling water, a pinch of salt, and 1/2 teaspoon of vanilla extract.